I was going to write a post about kayaking, which I did this weekend for about 20 minutes, atop a huge kelp bed in the Monterey Bay. 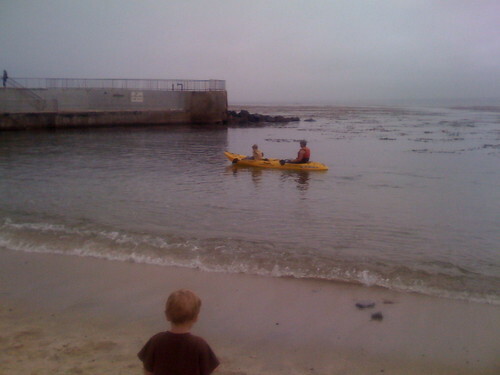 But, well, there’s not much to say that’s not in the photo above- of my 2-year-old nephew Tilden looking fondly at his dad & brother kayaking off of Lover’s Point in Pacific Grove. No, instead I spent about 6 hours driving around the Bay Area this weekend amidst truly awful traffic. And, admittedly, I made 4 wrong turns which didn’t help. I listened to “Wait, Wait! Don’t Tell Me!” – 3 podcasts- and 3 Terry Gross interviews on Fresh Air. I listened to silence. I made up stories about the people in the cars around me. I ended up in the worst neighborhood I’ve seen in the East Bay, trying to get gas. I drove between temperatures spanning 35 degrees, I heard new sounds and smells out of my car, I got to drive on a few new overpasses over the Oakland maze (that are a little vertigo-enducing). I managed to arrive at my destination a little sweaty and annoyed, but quickly soothed by a beer or a hug. I love the Bay Area, but I really hate driving. I love carpooling, trains, walking, busses. Maybe that’s why I live in SF. I remember talking with two college friends, over dinner one vacation from school, and we all decided that living in a pedestrian city would be the best. Walking up to friend’s houses with a mug in our hand, waving and chatting on the porch. Having said that, after driving so much this weekend, I spent thirty minutes at home then hopped back into my car, picked up a neighbor and drove 5 miles to trivia on Geary & Masonic. Yes, we could have taken the bus (and I have bought a MUNI card this month!) but it’s only 10 minutes driving, and crossing the top of Russian Hill we compared routes on the fastest way. After trivia ran late we could bundle up in the car and get home despite the late hour. It’s nice to have the bus option, I guess. Written Monday, August 4th, 2008 in local color. You can leave a response, or trackback from your own site.